I had a Malayali colleague once. He and his wife would wake up early every morning, make breakfast and cook lunch before they left for work. They lived at far off Navi Mumbai and travelled by train! Always used to amaze me. How could people do this? Breakfast: Sandwich of American Express Bakery multi grain bread with mushrooms and corn boiled by Banu the previous day. There was a sliver of cream cheese in it too. Papaya chopped by Banu the previous day. Coffee. Though Sassy Fork, Chef Jay and I felt that we were better off erring in side of safety here." I am not a big fan of boiled/steamed mushrooms either. I like them best, slightly sauteed with a knob of butter or olive oil. Next time, try sauteing the mushroom and corn together with some onion and garlic and maybe a herb and then fold it in the prepared couscous. Saee: i normally get Banu to do this so have to keep instructions basic. in this method we don't use any oil though. Will try saute'ing next time. Corn has to be boiled though? Aah. Training the maid can be a challenge. I am proud to announce, by the way, that mine has now learned to use celery stalks (yaay)! About the corn--like I told you, just zap it in the microwave for a minute, or if it is frozen, saute it in a hot wok; the moisture is enough to cook it through. Then toss in the mushrooms, and add to the cooked couscous. 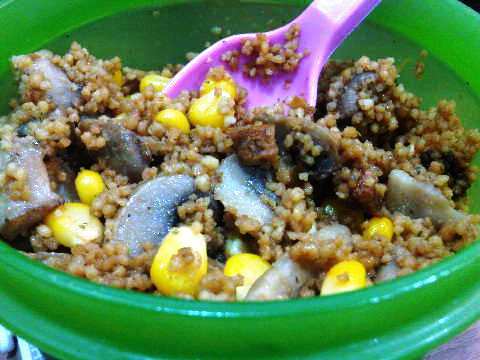 agree with @Saee - aldente corns with mushrooms sautted in olive oil and seasoned with pepper will take couscous to another level ! Coucous ke bangla te ki boley. Could you please let me know. It looks a lot like suji in the pic.